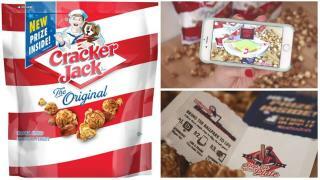 (Newser) – For almost 125 years, every box (and, these days, bag) of Cracker Jack has come with a prize—some tangible thing, be it a trinket or a temporary tattoo. Now, in an effort to show that the Cracker Jack brand "embraces a modernized, young-at-heart attitude," PepsiCo's Frito-Lay is replacing the prizes of the past with a "Prize Inside sticker," according to a Thursday press release, except it's not the kind of sticker you stick to a paper. Rather, Cracker Jack eaters will have to download an app and then scan the sticker to partake in one of four "baseball-themed experiences"; sample experience: "show off your dance moves on a simulated baseball field jumbo screen on your phone." Writing for Gizmodo, Alissa Walker acknowledges that Cracker Jack prizes "haven't been cool for some time." But she adds, "They were real. They did not require a smartphone." cracker jacks are yesterdays news.